Witch’s Brew is quick to play, easy to learn and fun. Goal: Earn the most victory (Witchery?!) points. Players start the game with a set of 12 roles and a few resources. To start, you select five roles, keeping them hidden from the other players. Each role has a major and a minor power, which will allow you to take more resources or gold, or to brew potions. The first player selects which role to play first. By default, the first player always must opt to use the card’s major power. Proceeding clockwise, each player must play that role card if they have it in their hand. Once you play the card, you must decide if you wish to exercise the major or minor power. Major powers give a bigger reward than the minor powers, but can evaporate at the blink of an eye. If you chose the minor power, you immediately act upon it. If you select the major power, you must wait until all players have had a chance to reveal that role.If a subsequent player decides to use the major power of that role, then you must discard your role card and you do not have the opportunity to act on that role’s actions. If no other player opts to use the major power, you may then act up on the role’s major power. The player who won the major power then selects the next role card. Once all players have played all five role cards, everyone takes up all role cards into their hands and select a new set of five. Play begins again, with everyone using a new set of five role cards. Gameplay ends when a specific set of potions cards have been brewed. You then count up your victory points. 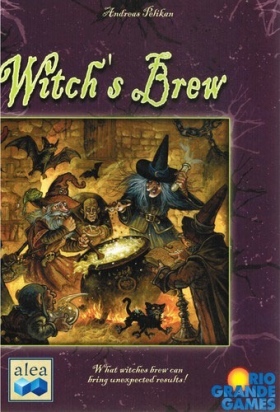 Very easy to learn and very quick to play, I quite enjoyed Witch’s Brew. It’s a bit light on strategy, but it does offer multiple ways to win, thus it can be difficult to know who might have the most victory points at any one time. It’s also fun to try and out-think your opponents during the role selection phase. Do I go for the big money, or play it safe? If your gaming group has theme nights, pull this one out for the Halloween challenge. Witch’s Brew is worth playing more often than once a year, but is a shoo-in for late October.